Is there a time out feature on this? If I try to author a Blu Ray over 15 GB in size the program quits before it finishes rendering the movies. Works fine on smaller projects. Are you getting any error messages? Have you tried to make an ISO file or folder set? Desktop. Unit has a massive cooling system. I doubt it is heat. 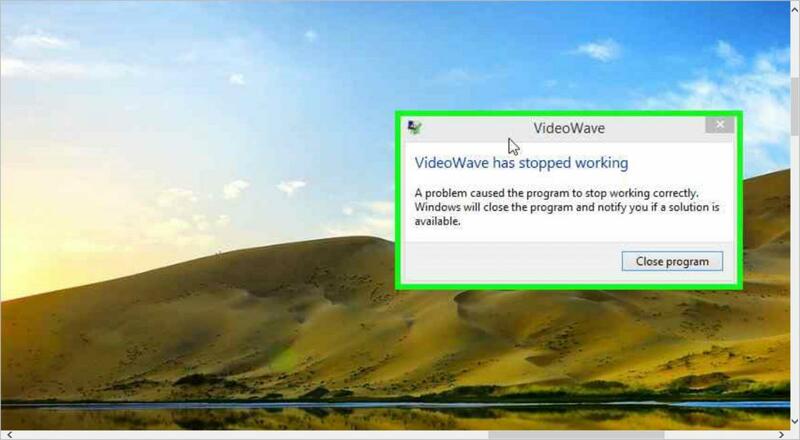 All I get is ans I paraphrase "VideoWave has quit working, please close program...."
I CAN bun Blu-Rays up to about 15 GB after that the problem occurs making me think it is a time setting. Once I hit the critical mass size nothing is possible - iso or disk. It all ends in the video encoding stage. Looks like there is a problem with "graphbuilder.dll". See the error messages at the bottom of the dxdiag text file. Look at the Windows Events log and you may be able to find more details. Have you tried to make an ISO or folder set to eliminate issues with burning the project? You may be able to do a repair.reinstall -with your antivirus OFF (not just paused) to get all the .dll properly registered. How do I do a repair install? I downloaded the product. ??? if your computer skills are really that bad, how do you expect to operate a complex editing program like Roxio? Open MS Paint and press the Ctrl-V keys at the same time. I figured it out. I had to turn off Roxio AVC Smartencode and switch to software rendering. My apologies for not knowing how to screen capture in 8.1, I've only just started to use it. I don't edit in Creator I use it for producing Blu-Rays. I edit in Creative Cloud bu they no longer support disk authoring. Their loss and Roxio makes a sale. PS I trialed many authoring software programs and Creator came the closest to what I wanted. Still not super customize able and too much plug and play but survivable. What do you mean by "plug and play"? What do you want to customize? There are quite a few "experts" here who might be able to show you how to do it. Yes, you are not using the Plug and Burn "feature" are you? Don't have 8.1 install but doesn't Prt Scr or Alt Prt Scr do what it always did? Most of my Blu-Ray products are season copies, very basic stuff. Or multimedia presentations, more complex and requiring a fair bit of options. If I use Mpeg2 Blu Ray there are two file audio and video. The program won't let me add the audio. These are the two formats I use the most because of quality, storage size and of course familiarity. If there are others that are better i'm all ears. I don't seem to be able to control the output codec that the disk is burnt with either. I'm not a fan of 24P and that seems to be my final result. I'd like very much to be able to create a blank menu or import a pre built .psd menu in layers and work with that. Or control the number of buttons on a menu or be able to create my own button. I'm sure there is a way I just haven't figured it out yet. I can't customize chapter markers to do things like stop and wait to advance. Or designate button hierarchy or designate end jump from spots on the timeline. I'm sure all of this is basic for you old hands here, it sure was in my last program for me. As for 8.1 it is a huge change for me and I can't find the control panel half the time! LOL Just not used to it yet. My previouse 16 years of editing were all in mac but with the demise of Final Cut at the launch X I decided to get into IBM for my next unit and here I am. Not sure I understand what "Media encoder" is, no such product in Roxio... And Nothing in the Suite produces separate audio files. Although an Authored DVD Movie will have an empty folder called Audio_TS. You are correct that there is not a provision to choose a specific encoder. It is chosen for you based on your output. Almost all Commercial BD Movies are at 24 fps. It is good enough for Hollywood. For 8.1 and about all others, Win-Pause keys bring up System. In the header is the All Control Panel Items as well as at the upper left is the link to Control Pane Home... (don't have Win 10 yet but my guess it that it works there as well. You know what? Go screw your hat! I produce two TV series of 13 episodes each. Not like I need to explain to someone as rude as you! Unfortunately, if there is a copyright issue suspected, then it needs to be cleared up and shown not to be an issue, otherwise, the discussion ends. Corel can't support breaking copyright law, and if the discussion went in that direction, these boards could be shut down. So, it's in all our interests to sort out if there is or isn't a copyright issue, even when we don't work for Corel. If there isn't an issue, just explain it. lol yikes, I don't want to get in the way here but a VERY simple way to grab ANY part or any section of anywhere on any screen, even on mulitple monitors, is to use Snipping Tool. 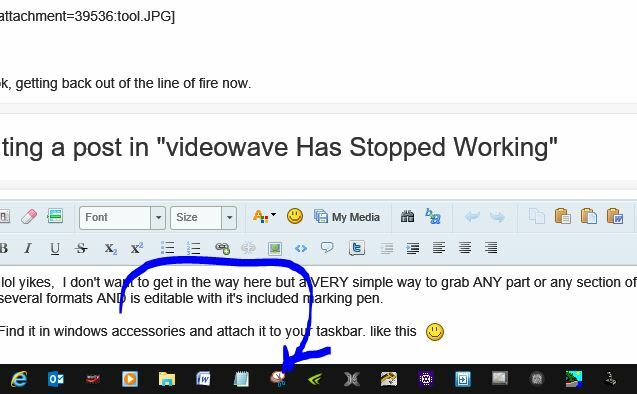 It's available in win7 8 and 10 and can save in several formats AND is editable with it's included marking pen. ok, getting back out of the line of fire now. I said in my early post that I don't use Roxio to edit. I use Adobe Creative Cloud but in 2013 they abandoned Encore their disk authoring program in the belief that all digital files would be shared through the cloud. My sponsors are old school and like a set of season disks to put on the shelf. So do most potential clients. I was using 6.5 CS and didn't know about Encore until I'd converted. I've produced www.outdoorquesttv.com for 16 years and www.trappinginc.com now in its second season of production. Who knew it could be so hard to burn a disk! I'll move on and when Roxio wants to know why I don't use their program anymore, I'll send them this link. 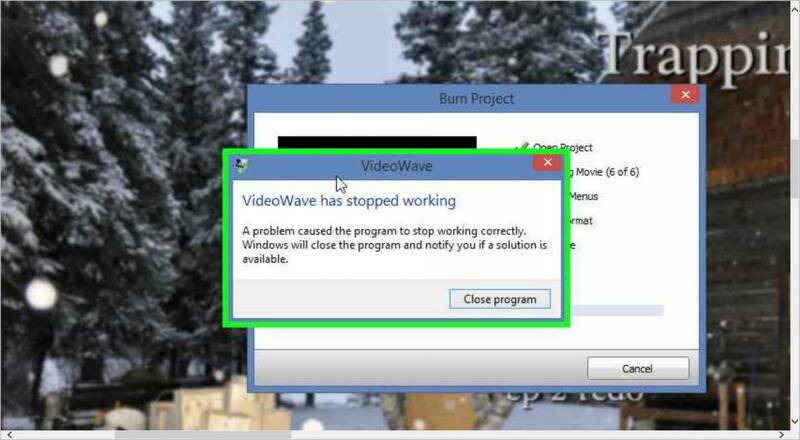 1) You would not use Video Wave to burn a disc, only to edit a video. You would use somehting like MYDVD or DVD Builder. 2) If you just want to burn a DVD, use the free ISOBurn to burn the disc from an ISO file or folder set. Surely you can make one of those from the Adobe product. 3) Did you ever hear of the honey or the vinegar. We don't work for Roxio/Corel; something in the above seem to hit a sore spot? Care to tell us about what it was? 4) Why are you using consumer designed programs rather than more commercial. sophisticated programs. Surely you can get your customer to pay for it. Have you? Please reread your response to me where you accused me of being crook.All I came here for was a little assistance. There is no underlying conspiracy theory. I only want to get my work done with out the hiccups caused by things like the world abandoning disk authoring. You would think it would be easy to burn a Blu-Ray in today's world. It was way easier a few years ago. I can't find a good program, sophisticated or otherwise. It was VideoWave that was failing when encoding for the the iso or disk burn, I got that figured out on my own. I had to get creator in order to get more options in MyDVD and I believe to enable Blu-ray. That last could be wrong there has been so many programs and I'm not that good on the computer stuff. Please tell me the response number where I called you a crook. The response number is in the upper right of the response. Let's start all over again. What kind of files do you have and what do you want to do with them? Are the files high definition files that you want to put on blu ray or are they standard definition so that you just want to make use of the extra space. Do you have a blu ray burner? Are blu rays OK for your customer. Please for now, don't post about other software if it is not critical to the above. Jim raised the question of copyright in post #14. RichM_Ab got quite defensive, and I replied that copyright issues are a concern on this board and all he needed to do was to clarify what he has, so that the discussion could continue. I think he's done that, and indeed, the discussion has proceeded, though Rich could pay closer attention to who is actually responding to him and saying what. That said, it can be confusing to keep track of who one is responding to. Files are all HD, some 4k that is unimportant at this point. I have blu-ray burners. Customers have been accepting blu-rays for 5 or 6 years. I want to be able to get a 13 episode season on a 3 disk set to maximize quality of the finished product. When I export from my editing software in H.264 Bluray or Mpeg2 Bluray I end up with a video and audio file not a combined file that holds both like Quicktime .mov files. MYDVD accepts the video half but not the audio half unless I put it in the music channel. Is this correct procedure? I have been using the same editing software for years and have not kept up on others. Why are you using your video editing software that give you the demuxed files? If you must use those, then you must combined them (mux) to have both the audio and the video. Adding the audio the video in Video Wave would be correct but can lead to sync issues. All audio channels perform the same function so you could add the audio to the music channel, the Narration channel or the sound effects channel. You can use more than one audio channel to add comments or other narration. Video Wave should accept either of your H264 or mpg2 files for blu ray. Note that the mpg2 files will be larger. Do all your editing in Video Wave to make life easier. Once you have a blu ray full of outputted files, open MyDVD . Select blu ray and select if you want a menu or not. You can be fancy in menus or just select one simple one. You could also make your own menu background. Add the videos (episodes) to the menu. You will probably have several pages of menus. Burn (output) the project to a ISO file and when it is finished, burn the ISO (not copy) to the blu ray from the program on the Home page. If you mux the video and audio, you could also just archive the files to a blu ray using that part of the suite of programs. Should I wait for an apology !